Free to the Public! 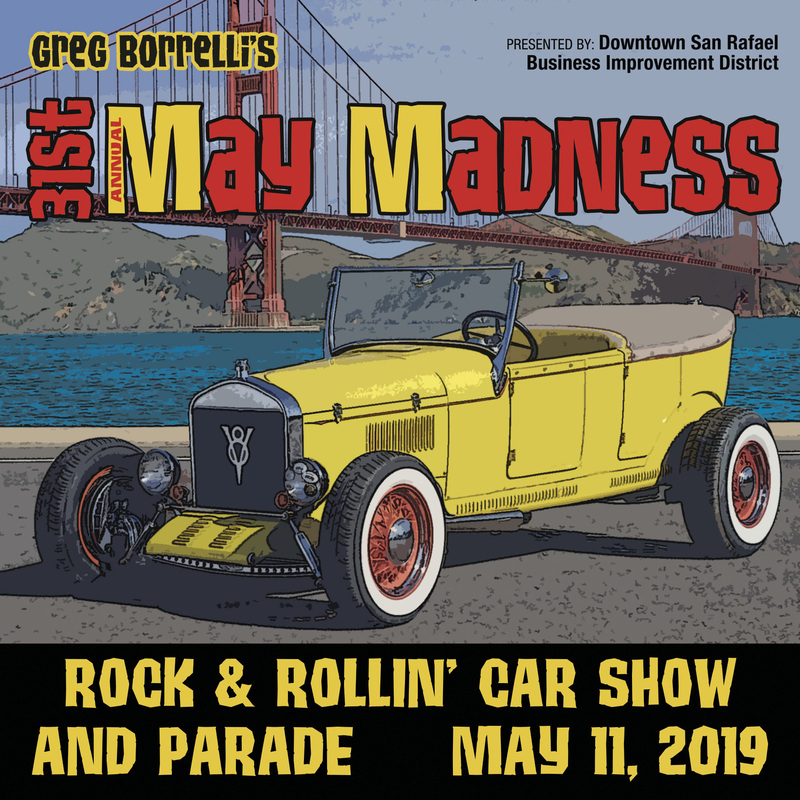 Join hundreds of fans to check out 200+ incredible classic and custom cars at May Madness, the longest running Car Show and Parade in Northern California! Starting at noon on Sat. May 11th, view the cars and enjoy food and drink, people watching, and rocking out to the tunes of the 50s & 60s. Pile the kids in the wagon and see the Parade at 6 p.m. at this free family-friendly event. Spectators will get an up close view of the finest Rods, Customs, Classics, Art Cars, Utility Vehicles, Modified and other Cool Vehicles. Trophies are awarded for Best Paint, Best of Show, Best Hot Rod, The Greg Borrelli Memorial Award, Mayor’s Award and many more. New this year is the Friday Night Cruise. It will take place on Friday night, May 10, in remembrance of the good old days of cruising Fourth Street. The engines will rev beginning at Terra Linda High School and cruise down to Downtown San Rafael. Afterwards, enjoy the optional BBQ at the Elks Club Lodge for $35/person. All of the net proceeds will benefit Camp Chance an SRPD hosted camp for at-risk and underserved middle school kids. More: https://campchanceconnect.org/. Greg Borrelli created May Madness over 30 years ago, to commemorate those amazing Cruise Nights here in the 50s. George Lucas captured the magic of those festive, furtive summer evenings in his film American Graffiti, which was partially filmed right here on Fourth Street Downtown! Come be part of the magic and nostalgia, help keep the tradition in top running condition! For more information, visit https://downtownsanrafael.org/2019-may-madness-scheduled-for-may-11-2019/.